Lipton and Stafford gravy and sauce mixes have been a foodservice tradition for over 30 years. The preferred choice to pour onto a hot sandwich, fries or to enhance a buffet. 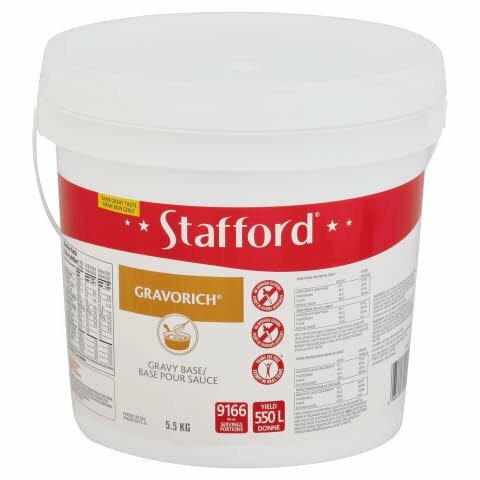 DIRECTIONS: For 500 ML (OR 2 CUPS) GRAVY GRAVORICH GRAVY BASE 6 G 10 ML 2 TSP SHORTENING 40 G 40 ML 2 1/2 TBSP FLOUR 35 G 65 ML 4 1/2 TBSP BOILING WATER 500 G 500 ML 2 1/4 CUPSFOR 4.5 L (1 GALLON) GRAVY GRAVORICH GRAVY BASE 45 G 60 ML 1/4 CUP SHORTENING 350 G 350 ML 1 1/2 CUPS FLOUR 300 G 550 ML 2 1/2 CUPS BOILING WATER 4.5 KG 4.5 L 1 GALLON MELT THE SHORTENING. GRADUALLY ADD THE FLOUR AND STIR UNTIL SMOOTH. ADD THIS MIXTURE SLOWLY WHILE STIRRING INTO THE BOILING WATER IN WHICH THE GRAVORICH HAS ALREADY BEEN DISSOLVED. COOK UNTIL DESRIED THICKNESS (minimum 85 °C/185 °F) . Convenient instant base for gravy and other brown sauces. Also can be used as an instant flavour enhancer for soup or stews. An ideal product to be trusted on its own for your brown sauce needs, to enhance the flavour of your own scratch demi-glace.